This statue is currently being made. The same person who painted the Valtiel statue is painting this one. Your work is gorgeous! Where can i see them again?!?!?!?! I have something special cooking up that I hope to unveil soon. The pictures will return soon, I promise. Are you going to put that "something" here? This is the only topic i follow every day! And, sorry, but i could have missed this from you: what figures do you exactly have? I have: Valtiel, PH with Knife, PH with Spear, Bubblehead Nurse, Missionary, Lying Figure, Boogeyman (SHH), and 3 Heather's: one normal, one painted as MoA, and other one modified to look like Heather/Sharon from SH: R.
Do you know where could i get the others? 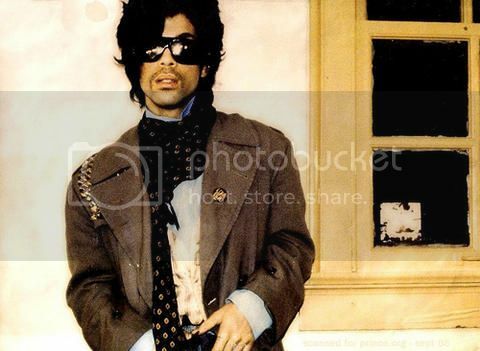 like, Robbie, Mannequin, James Bust, Abstract Daddy, etc.??? So, do you know where could i get them? Can i buy them in Hellpainter's site? or do i have to look somewhere else? Wow!! You have a LOT of statues! How come you have never shared any pictures of them? I'd especially like to see your MoA version. Do you buy most of your statues from the Mexican seller on eBay? No problem, I'm always glad to help. Yeah, I know a fair amount about these figures. You seem to know about some others that I haven't posted here but instead over at the FB Collector's Group. Are you a member there? I'd suggest you sign up if you haven't. Anyway, HELLPAINTER's Lying Figure, Abstract Daddy and Mannequin are out of commission. I believe he made them between 2009-2010 and sold a very small handful each. He also has made two or three RPT models. Two are basically the same except one holds the spear, the other the Great Knife. He also made another that mimic's HEADLONG's RPT statue pose. As for the James' bust, I -want- to say that was fan-made. I believe someone bought HELLPAINTER's RPT figure that includes James' head underneath and turned it into a bust but I may be completely off on that. I was never really interested in that model so have done little research on it. One I know little about is the SH3-version Nurse. This nurse actually has a face and hairstyle identical to the ones seen in SH3. As for purchasing, most of these are/can only be sold at Wonder Fest. As they are based on licensed IP, the artists require a special one-day permit from the respective IP-owners to sell their work at WF. Outside of that, there's really no place to buy them "officially." A safe/easy bet is to wait for that seller from Mexico to make illegal recasts of them for sale on eBay. No, i don't get those from that seller. I get mine from a seller from the UK. He doesn't sell those anymore, and he had Robbie! now i don't know where to get him or the other ones D: i guess i'll have to wait for those illegal ones. but are they at the same scale? too bad you don't know about that SH3 nurse one, it sounds awesome! Well, if you find one of her someday, tell me if you buy it, or even better, if they have another one to sell! Let's wait for your surprise, then! 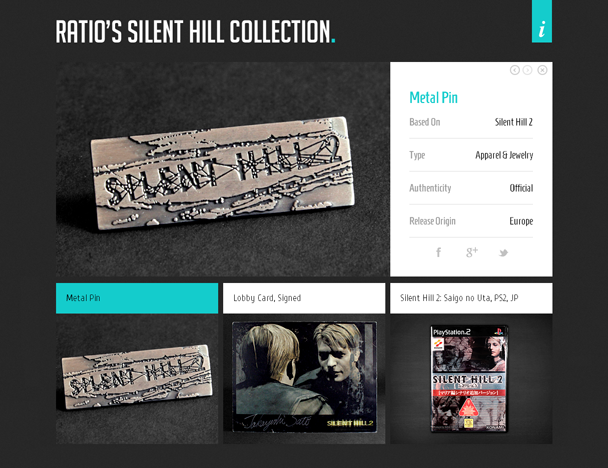 I'm happy to announce the launch of my Silent Hill Collection website, "Ratio's Silent Hill Collection"! The site will be updated daily with a new item so be sure to visit periodically to see more Silent Hill items. In addition to the site's daily updates, I will post news announcements periodically here, also. It was a quite the process to complete due to various delays and other priorities, but I'm happy and thankful to finally have it finished and ready to share with others. I hope you all find the site interesting and, more importantly, easy to navigate. I was really surprised how hard it was to make and stick with a "less is more" approach to the site's minimalist design. Hopefully it will pay off in a pleasant user experience! If you're up to it, let me know your thoughts and impressions of the site and thank you for taking the time to visit. See you in the Otherworld! Hey that is one excellent looking SH collection site, I like the quality of the images, professionally looking all over so good job!. The calendar cards I believe came free with one of the Silent Hill film DVD box sets in Japan, they're not hard to find. A SH3 Heather wallscroll and a Pyramid Head "Welcome to Silent Hill" wallscroll. Both being about as tall as I am (i'm only 5'1 or so though, so that's not saying much) Neither are hard to get ahold of atall, so anyone collecting SH stuff most likely has them. I would try to get all the SH stuff I can if I had the cash to do so. One day I may try collecting more items though. I'd kill to have the stuff you have. That collection is tear jerkingly beautiful. Well, my collection is going to look pretty sad next to everyone else, but this is just the beginning! Working on a part-time minimum wage budget around a college schedule doesn't leave much for collecting, but I have my eye on a few things.. 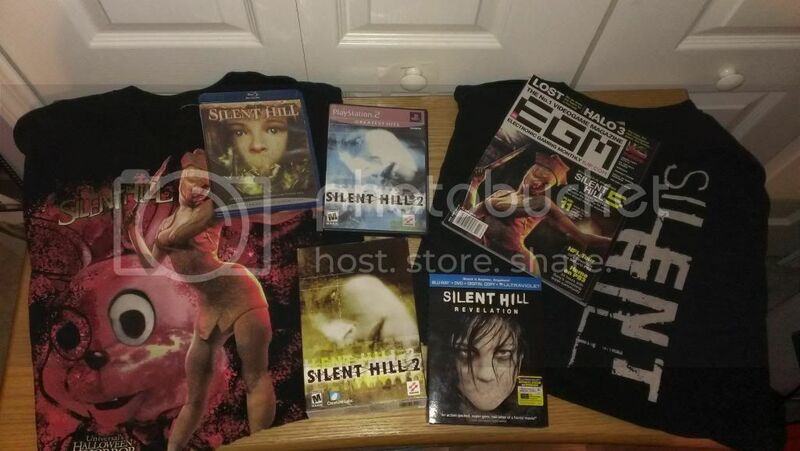 The second t-shirt on the right just features the Silent Hill font. On the back between the shoulders there is also a small image of Robbie. The rest is pretty self explanatory.. I have both movies. I also have a PC copy and a PS2 copy of Silent Hill 2, which is definitely my favorite. I've played most of the others but I'm trying to get my hands on actual copies of them..
Lastly is a copy of EGM magazine that featured an article on Silent Hill and made me do a fan-girly squeal years back. As I said, it really isn't much. I've been interested in the series ever since I saw my older brother playing it when I was just a child, but I don't really have the income to support everything I'd like to buy! But that doesn't stop me from browsing and admiring everyone else's lovely collections. Items Iâ€™m looking for â€“ Things I would like to add to my collection. I still have to re/take pictures of all my new and old US/EU guides and a few other small things I forgot but the site should be all up to date early next week! WHAT!? The Silent Hill revelations OST came on CD!? I haven't seen it in any store! It didn't it was canceled. I got this off ebay it was a retail promo sample given to music store to get them interested in ordering to sell. I'm a collector of Silent Hill stuff, although I'm not sure how to upload my pictures to this site. But I have two Red Pyramid Things and one custom painted Valtiel (highly recommend this painter).